Sound good? Classrooms these days nationwide are incorporating creative visualizations, positive affirmations, yoga poses and breathing exercises as well as fun games and kinesthetic challenges thanks to organizations like Yoga Ed. On the road to successfully integrating their K-8 Yoga PE curriculum for students, and a Yoga Tools for Teachers professional development program for classroom teachers into LAUSD, Yoga Ed. is fulfilling its mission to bring the mind/body health benefits of yoga to schools everywhere. Yoga Ed. is also rapidly expanding its outreach across the country through its 150 certified instructors. 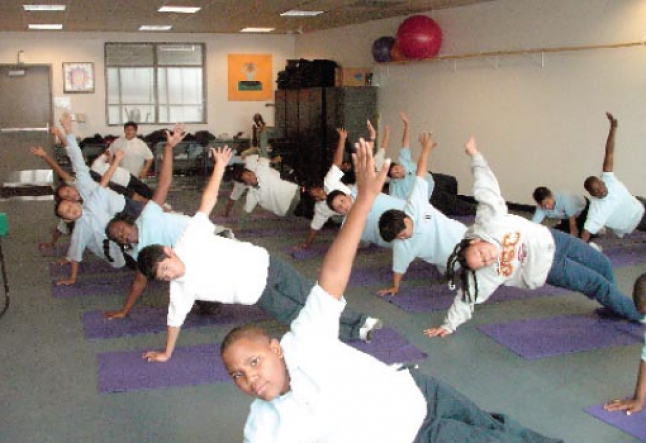 In 2002, founder Tara Guber and Program Director Leah Kalish joined forces to create the first yoga program for schools to meet PE Standards. The Yoga Ed. K-8 curriculum integrates the scientific study of the body and health with the development of character and emotional intelligence. The outstanding results of the Yoga Ed. PE Program at The Accelerated School (TAS) in Los Angeles garnered a full research study by California State University. This study showed TAS as having the highest fitness levels in the district. Positive correlations were also found between participation in Yoga Ed. and grades, discipline and self-esteem. In January 2006, Yoga Ed. reached new heights and was awarded a Physical Education Program (PEP) Grant through the Accelerated School, the Los Angeles charter school home of Yoga Ed. This grant funded 36 to 40 Yoga Ed. trainings over the following years. The PEP funding allows Yoga Ed. the opportunity to provide two-day, five-day and seven-day trainings to classroom and PE teachers. The two-day Tools for Teachers Program familiarizes classroom educators with experiential exercises such as “Time in,” in which students are led though creative visualizations that utilize music and relaxation techniques. Prescriptive affirmations are tailored for each student to help them move past limiting beliefs and emotional issues. And of course, yoga postures, breath work and creative fun are at the core of Yoga Ed.’s curriculum. “Bear Breath,” “Rainbow Shower,” and “Yogi Benders” are some of the exercises and games that are a part of Yoga Ed.’s mindfulness repertoire. Yoga Ed.’s product creation is Yoga Pretzels (Barefoot Books). A beautifully designed deck of cards, Yoga Pretzels illuminates the joy of yoga positions, tools, and techniques for children in or outside of classrooms. The playful wisdom of these cards invites teachers, students, and parents to use yoga as a way of connecting with oneself and each other through creative play, visualization, and the wonderment of body movements and breath. Yoga Ed.’s mission and success is filling our cups with hope for a peaceful and harmonious future.